The Maumee Valley Volkssporters will host a volksmarch in Napoleon, Ohio during the Memorial Day weekend of May 25-28, 2012. The group is affilliated with the American Volkssport Association- a National Walking organization with local chapters all over the USA. 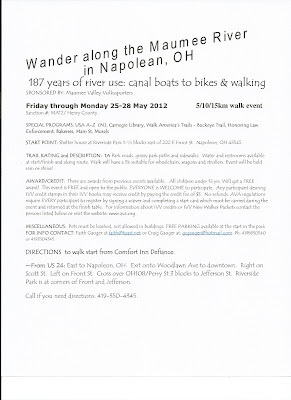 In fact 5 walking clubs in Ohio are hosting 5 walks in 5 counties on Memorial Day Weekend 2012. Other walks are to be in: Bryan, Archbold, Paulding, and Defiance. The headquarters hotel for the weekend will be the Comfort Inn in Defiance just off US24 at OH66. More info on the events can be found at ava.org. All of the walks will have a 5 kilometer (km) and 10 km distance offered. 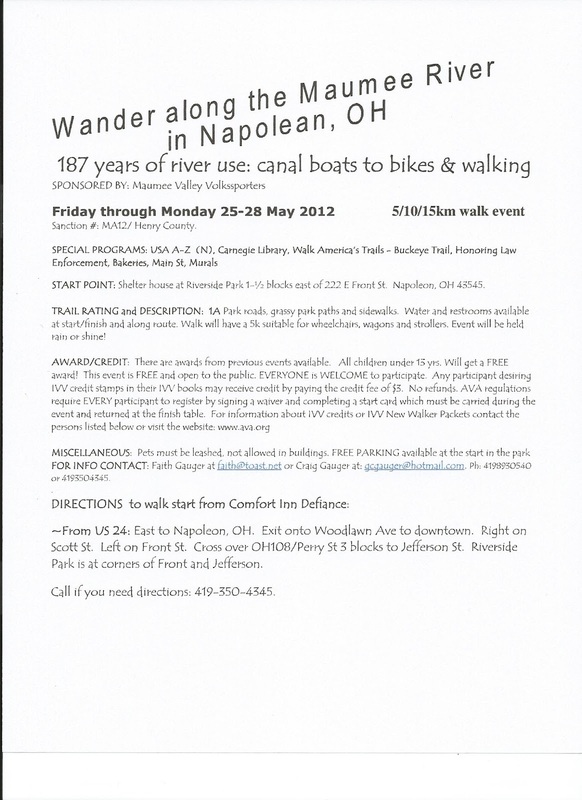 In addition the Napoleon walk will have a 15km = 9.36 miles route which will use a lot of the Buckeye Trail along the Maumee River. All walks are open to the public and are free. Awards from past events are free to all children 12 and under who participate.